One of the quickest and most tactical players in the late 19th century, David Janowski was feared by all of his opponents. With crushing, heavily lopsided scores over the older masters, Janowski showed that the new school was on the rise. He was able to accomplish many chess accolades despite detesting the endgame. Even though he lost to Emanuel Lasker in their World Championship match, Janowski continued to be a strong force in the chess world. 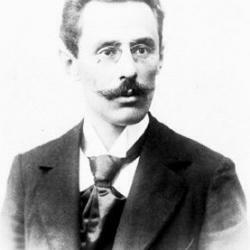 David Janowski began his chess career in 1894, a short time after he moved to Paris. Within a few years he began to win tournaments. He had match scores heavily in his favor against older masters including Wilhelm Steinitz, Mikhail Chigorin and Joseph Henry Blackburne. He did not fare near as well against the newer players though, having minus scores against Seigbert Tarrasch, Frank Marshall and Akiba Rubinstein. Janowski was also well known for having many excuses for his losses, routinely blaming something else when he lost a game. He did get the chance to challenge Emanuel Lasker for the World Champion title, but lost this match by a wide margin. Janowski passed away from tuberculosis on January 15, 1927.